The Center entered a joint development agreement with Kenzen to develop a dermal biometrics patch. SANTA CLARA, Calif.–W. L. Gore & Associates (Gore) recently unveiled its expansion in Silicon Valley with an 11,000-square-foot co-innovation space and lab. Focused on helping startups achieve breakthroughs at scale, the Gore Innovation Center in Silicon Valley combines Gore’s materials science expertise with innovative companies that have the hunger, momentum, and collaborative ideas necessary to disrupt the aerospace, automotive, digital health, consumer electronics, fabrics, and medical industries, the company said in a release. Gore offers rich materials science expertise honed over 60 years of exploring and implementing successful applications, ranging from implants in the human body, to clothing worn on expeditions to Mt. Everest, to electronic cables transmitting signals from Mars. "The Gore Innovation Center is a place for experimenting with new ideas, pushing boundaries and bringing together diverse talents to deliver transformative solutions that improve lives," said Linda Elkins, co-leader, Gore Innovation Center, in the release. "Gore has built a reputation for solving complex technical challenges in the most demanding environments, bringing deep knowledge and foundational materials to Silicon Valley to drive ideas forward and build prototypes to create value for all partners." The Gore Innovation Center recently entered into a joint development agreement and cash investment with digital health startup Kenzen. Gore engineers and scientists are working hand in hand with Kenzen to develop a comprehensive wearable monitoring system–a dermal biometrics patch–that employs biosensor data and predictive modeling to anticipate avoidable injuries and health conditions. By incorporating Gore’s advanced materials, Kenzen aims to enhance the comfort, reliability, and durability of these on-skin applications. The Kenzen Patch comprises a variety of printed sensors that continuously monitor numerous health parameters and measure a variety of attributes, including sweat, heart rate, and body temperature. The system promotes good health by using sweat biomarker analysis in its sensing platform, along with custom algorithms via a companion mobile app that provide contextual insights about an individual's body when they are at work, even in extreme conditions. The device's thin, breathable layers are said to capture and deliver ongoing, real-time, clinical-grade biometric data. "Discomfort, skin irritation, and signal quality are among the biggest challenges for skin-based patch sensors and health monitoring devices today," said Kenzen CEO and Co-founder Dr. Sonia Sousa, in the release. "For sweat analysis, the ability to continuously transport volumes of sweat to and away from our sensors is critical. The investment and joint development effort with Gore will help push past these issues by enabling us to deliver highly-breathable, flexible materials while improving sensor performance and accuracy using microfluidics. We presented a complex set of material requirements for sensor selectivity and sensitivity, and it became abundantly clear that Gore's deep expertise in medical devices and high-performance fabrics would prove strategic in making Kenzen's products more comfortable, reliable, and easier to wear." 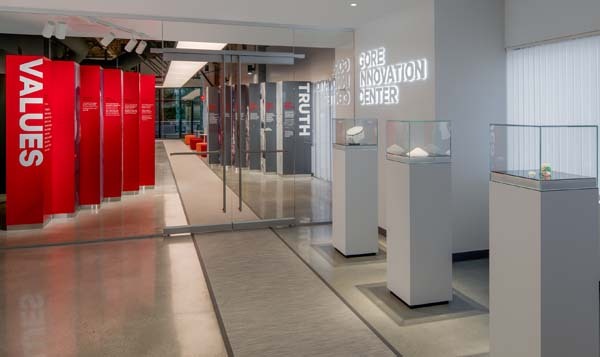 Gore founded its Innovation Center in Santa Clara so that startups, researchers, corporations, and customers can collaborate with Gore innovators on difficult advanced materials challenges in medical, fabrics, automotive, aerospace, industrial, electronics, and digital health applications. The goal is to create new business opportunities and value for all partners. The Gore Innovation Center offers prototyping facilities, access to its deep materials science expertise, and a co-working space for partners to co-develop unique solutions to difficult challenges across a wide range of industries. "Kenzen is the type of startup we wanted to collaborate with when we first imagined creating the Gore Innovation Center," said Linda Elkins. Gore Innovation Center Co-Leader Paul Campbell added, "For 60 years, Gore has been applying its materials science expertise to improve lives. Providing transformative and preventative health data solutions, using both companies' technologies, directly aligns with this legacy." The Gore Innovation Center (www.gore.com/innovation-center) also hosts events to foster technology innovation and collaboration within the Silicon Valley community.